Disney's Beach Club is a deluxe resort in the Epcot resort area at Walt Disney World in Orlando, Florida. This resort has both standard rooms and Disney Vacation Club (DVC) villas. This resort's theme takes you back to the classic Eastern Seaboard resorts of the 1920's & 1930's and is an elegantly casual hotel set on the shore of Crescent Lake with a wonderful view of the Boardwalk Resort. The hotel is within easy walking distance of Epcot and a convenient boat ride to Disney's Hollywood Studios park. The highlight of this resort is the 3-acre Storm-along Bay Pool which has artificial sand that's designed to fall to the bottom of the pool so the water stays clear....leave it to Disney to take care of details like that! Storm-along Bay has a pirate ship shaped water slide, a "lazy river" type channel, whirlpools, and zero entry beach area. Advantages - Proximity to Disney's Epcot theme park, entertainment and restaurants at the four other Epcot resort area hotels, poolside movies, an on-site Disney character breakfast, and a peaceful setting well suited for relaxation are just some of the many benefits of this hotel. Disney Deluxe hotels have queen beds, mini-refrigerators, and microwaves. This is a great resort for anyone who will spend time at the resort - rather than spending all of your time in the theme parks. There seems to be advantages for every age group here - families with young children love the pool's beach area and the convenience of shopping and dining options in this multi-resort area. Kids of all ages LOVE the expansive pool and recreation options here. Adult guests love the variety of dining options available in Epcot and in the 5-resort area, and older guests enjoy the balance of theme park accessibility and relaxation options. Disadvantages - Bus & boat transportation is sometimes shared with the Yacht Club resort, Boardwalk Resort, Swan & Dolphin hotels. The additional stops mean that the transportation takes extra time. The deluxe resorts are expensive and may not be the best value if you'll be spending most of your time in the theme parks. Storm-Along Bay is a 795,000 gallon sand bottom pool complex with a 230-foot waterslide, lazy river (current channel), and three (3) whirl pool spas. This pool is shared with Disney's Yacht Club resort and is the most extensive pool at Walt Disney World Resort. The Tidal Pool is a separate 43,000gallon pool in a quiet garden area, facing Crescent Lake. Dunes Cove pool is a 55,350 gallon pool for guests of the Beach Club Villas. The Disney Yacht & Beach Clubs are directly adjacent to one another so I've included dining locations available in both resorts but have noted which are in the Yacht Club. 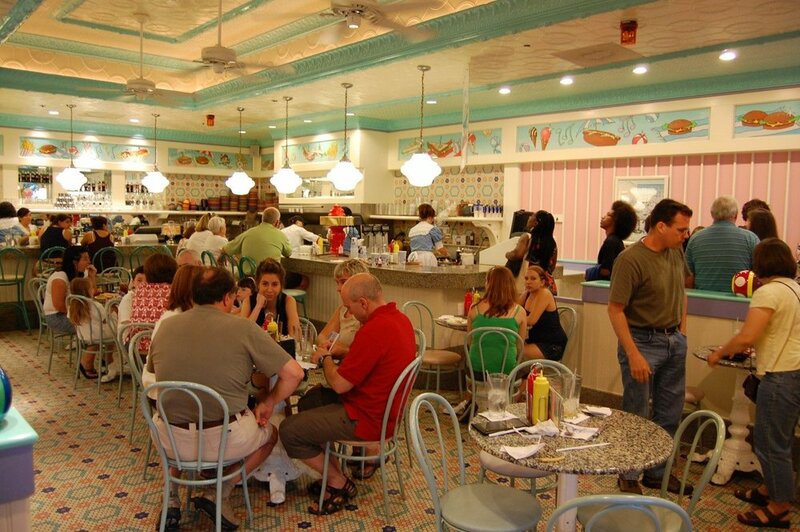 Beaches & Cream - '50s style soda shop that also serves burgers, hot dogs, soups, and great ice cream desserts. Beach Club Marketplace - sandwiches & snacks. Cape May Cafe - daily character breakfast (7:30 - 11:00AM). Dinner is a clam bake buffet. Hurricane Hanna's Grill - poolside bar that also has burgers, hot dogs, etc. Guests with Park Hopper Tickets can go into Epcot (walking distance) and enjoy all of the dining options available there. Captain's Grille (Yacht Club Resort) - Kids are welcome, of course, but this also is a great option in a nice setting for those with more grown-up tastes with steak and seafood options. Guests with Park Hopper Tickets can go into Epcot (walking distance) and enjoy all the unique shops in the World Showcase. Groceries - The gift shop features some grocery items. You can save time and money by having more extensive grocery needs, snacks, and bottled water delivered directly to the resort by Garden Grocer - Click HERE for more information. Regular hotels rooms do have mini-refrigerators but do not have full kitchens. Studio-style units have mini-refrigerators and microwaves. One-bedroom or larger villas come equipped with a full kitchen. Deluxe Room / Club Level - Lagoon View Club Level - snacks & extra concierge type amenities. Disney's Beach Club Resort includes rooms available to Guests with disabilities, including wheelchair-accessible bathrooms and rooms designed for the hearing impaired. Guests may use Disney's Magical Express - a shuttle bus service included in your reservation - between the Orlando International Airport and Disney's Beach Club Resort and Villas. There is also a water launch / friendship boat that takes guests to Epcot and Disney's Hollywood Studios theme parks. Guests can take the boat to get to the other Epcot resort area hotels, restaurants, and entertainment. Buses available for travel to Disney's Animal Kingdom, Disney's Magic Kingdom theme parks, Downtown Disney, and the Blizzard Beach and Typhoon Lagoon water parks. Disney's Beach Club is probably our favorite deluxe hotel at the Walt Disney World Resort even if it isn't near the Magic Kingdom or the monorail. The setting is pretty and the pool is amazing. You really can skip the theme parks and still have a great vacation while staying at the Beach Club. Beaches & Cream is a fun little restaurant and the proximity to all the Epcot resort area hotels, restaurants, and activities makes this resort an ideal choice. You're right next to Epcot which means anyone with a Magic Your Way Park Hopper ticket has access to an incredible number of restaurants. If this resort is out of your budget for your whole vacation, consider staying here for a night or two at the beginning or end of your trip - it'll be the most restful part of your vacation. We like the Beach Club better than the Yacht Club - which shares the Stormalong Bay pool - just because it is a little more relaxed and a little less dignified. Transportation was the weak spot at this resort but Disney is responding to Guest comments and this has recently improved somewhat. You have one agent who know how to help you with every step of the planning process. 1800 W. Epcot Resort Blvd.